Hello! 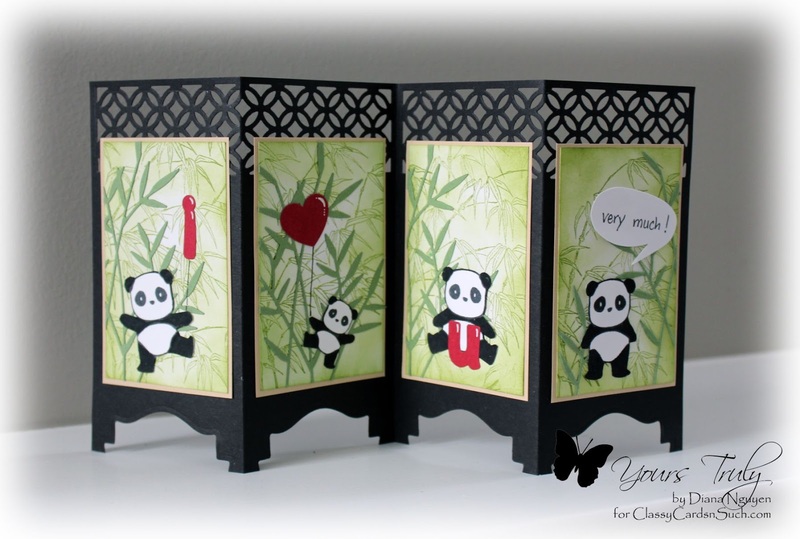 I found this tutorial on Splitcoast Stampers and I thought it would be perfect for an Asian inspired card. Plus I have 4 boys - 4 panels - 4 pandas... so nice when things come together! Bonus for fitting inside a regular A2 envelope too! The directions on the tutorial are very clear and easy to follow. For the top of my screen, I used the Impression Obsession Fancy Border Cutout and the bottom legs were done with Spellbinders Labels Eighteen. To make my screens, I stamped an old bamboo image in Old Olive and then added a green die cut of Memory Box Bamboo Shoots. I didn't want the four screens identical but just by angling the stamp and repositioning the die cuts, you can create different scenes. 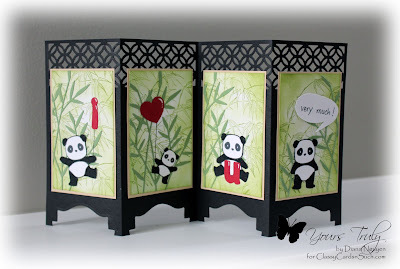 Finally, I added some pandas from Mama Elephant Pandemonium holding Lawn Fawn's alphabet dies. I made them into balloons by drawing a line and adding shine with a white gel pen. The bubble speech in the last screen was handwritten and free hand cut. This is so cute! It makes me think of your littlest panda! I love how you were able to make each panel individual yet still have the whole card harmonious! Adorable. Love this panda screen card. Oh, this is so wonderful! I love the shapes you used to create the base. Great job! Gorgeous ! Fantastic design ! Hello Diana, Been searching all over the place to make this card with the Decorative Label punch from S.U. I see above that used Spellbinders labels dies! I do have a few of those. However, my question would be/is, I have a Big Shot, do you fold all the panels and run through the machine, or 2 at a time, or singly? And how would that fit in the BS? I want to make this so bad & need help on just how to run thru the BS. TY for your time. Or is anyone else can enlighten me, please do. I only run two layers max at a time through the Big Shot otherwise the cuts just aren't as clean. Since the Big Shot can fit 6 inches wide, folding in half should fit and run through twice. Did you check out the link to the SCS tutorial? Those are really handy too. Hope this helps.